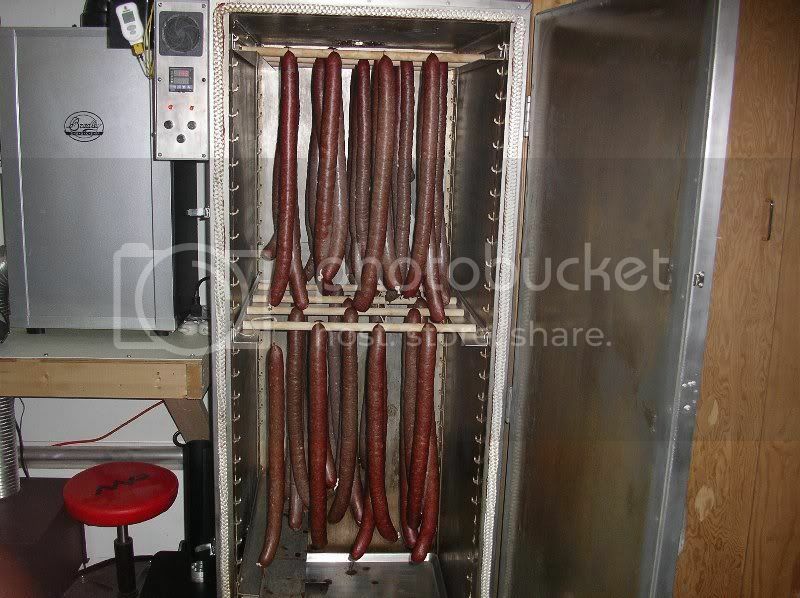 I just finished a 60 lb batch of Kielbasa in my home built unit with a Bradley smoke generator. I had lots of room and feel confident I can do a batch as large as 100 lbs. 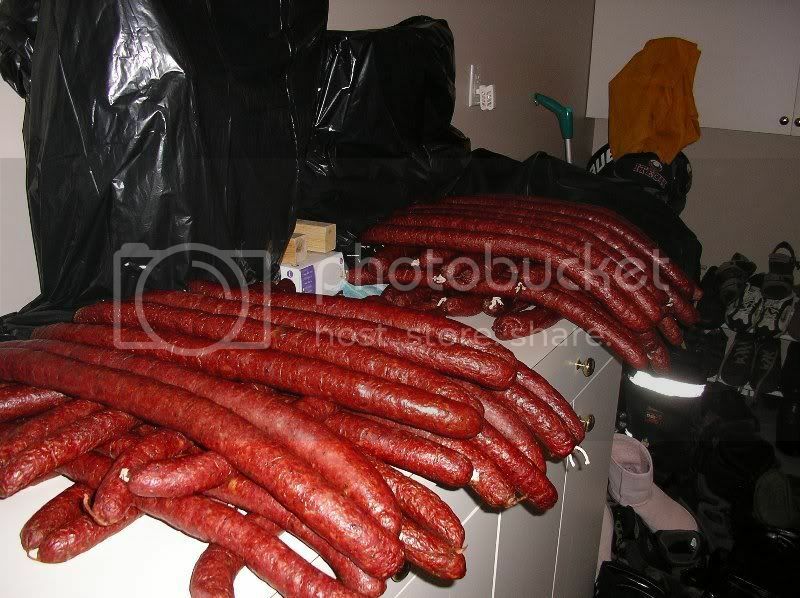 The recipe is more or less from Rytek Kutas's book "Great Sausage Recipes and Meat Curing" with a couple of tweaks. I mix it in 20 lb amounts simply because it's easier to mix that way. It just so happens that I have some new open storage space here and would be happy to temporarily store that fine looking Kielbasa. After I finish eating it, I'll let you know how it all tasted. The Kielbasa looks fantastic. 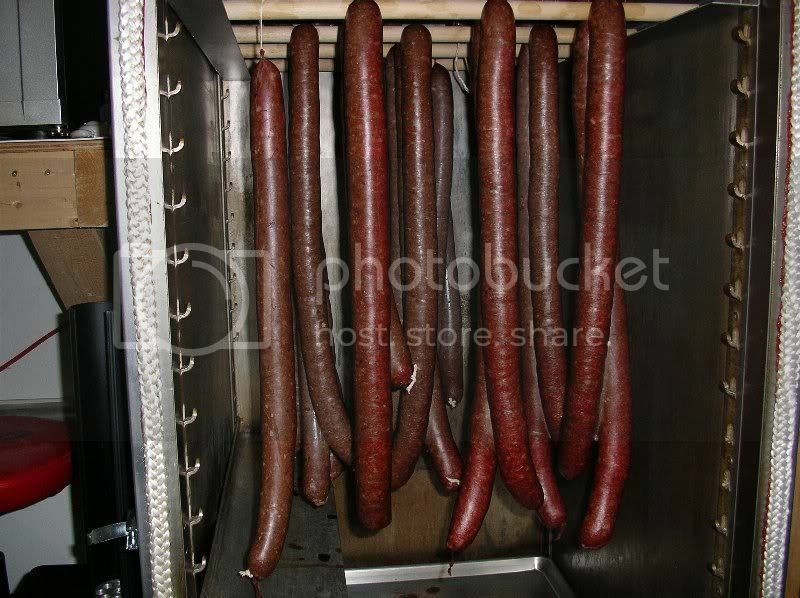 How in the world did you cool the sausage after taking them out of the smoker? Whats the wheat crumb for? I use the same recipe but do not remember that ingredient. (I know you added the cayenne also). I have a full size laundry tub and a set of cabinets (kinda like a kitchen) in a finished storage room in the basement. It works well for this. The links are about 22 to 24 inches long. The other option I thought of was to through them in a snow bank. We've had about 6 to 10 inches of fresh snow and -30 temps... wouldn't take long. The steam part was interesting and the IT of the sausage definitely comes up quicker. I still want to play with it a bit to get it as efficient as possible. It is a great recipe with the added cayenne isn't it! Makes for tasty snacks! The Wheat Crumb is a binder that I get here at a local sausage supply store. I used to use powdered milk but this works just as well for a binder and is much more cost effective. I'm not sure if Wheat Crumb is more of a local product here in Southern Saskatchewan or not. Southern Saskatchewan is a major wheat producer so that may have a bearing on it. The Wheat Crumb is a binder that I get here at a local sausage supply store. I used to use powdered milk but this works just as well for a binder and is much more cost effective. OK, I did not notice that you excluded the powdered milk. That makes perfect sense. 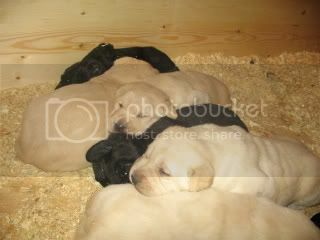 .....The other option I thought of was to through them in a snow bank. We've had about 6 to 10 inches of fresh snow and -30 temps... wouldn't take long. That would work, just watch out for the yellow snow. the last batch I did just layed them in the snow on my deck,they cooled off real quick [I left the thermometer in] and in 25 mins. they were resting in the fridge. Weather was 25 below celsius. worked great. i am a ways from doing sausage, but i have ordered the sausage making/stuffing dvd from the sausage maker. That's the only way! Just dive right in! Seriously, if you do some reading both here and online you won't have any problems. Rytek Kutas's book "Great Sausage Recipes and Meat Curing" really is a must. Not only does it have a lot of great recipes in it, it also goes into great detail on all aspects of making sausage. Definitely a good investment. i did invest in the book, but i thought that it wouldn't hurt for a chance to get my eyes on the process. that is why i ordered the video.....certainly can't hurt. You're right Jerry. Certainly if you have never watched sausage being made it won't hurt for sure. Keep us posted how your making out with it.